My family shrieks in horror when they hear the Partnerin tell them about things like this ... her family too. They wonder what I have done to their little girl. Hey, I tried to show her how to do them properly, with freshly shredded cheddar and jack cheese, but she likes the stuff from the jar. Oh well. Come to think of it, I have never found good mexican food in Germany. I had nachos last night too. There is no good Mexican food to be had in Berlin at least. So we just make our own. As for the shock of the Germans over Mexican food. 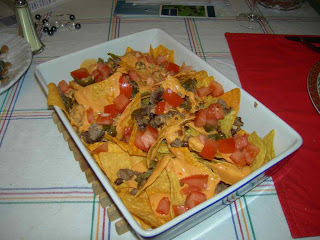 I have to think back to the first time I made Nachos and the look on my German wife's face when it registered that she would be expected to eat with her fingers... that no knife or fork would be required. Oh, and Americans consider themselves civilized! Christina: No accounting for tase, eh?